It’s a landmark event in UCT’s history. 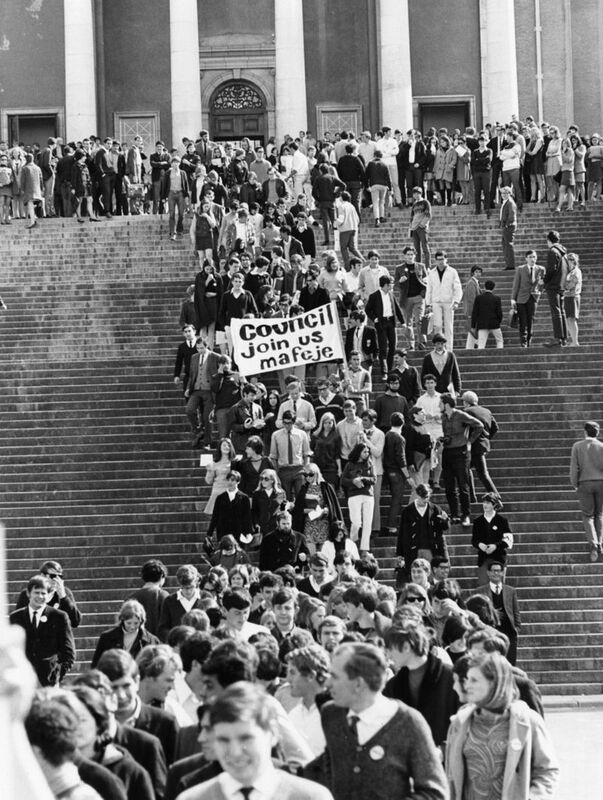 In August 1968, 600 UCT students – one tenth of the student body – occupied Bremner building to protest the Council overturning the appointment of black scholar and social anthropologist Archie Mafeje as a senior lecturer after pressure from government. The event was a watershed for UCT. Protesting students occupied Bremner and for nine days their peaceful sit-in was front-page news around the country, starkly dividing opinion. 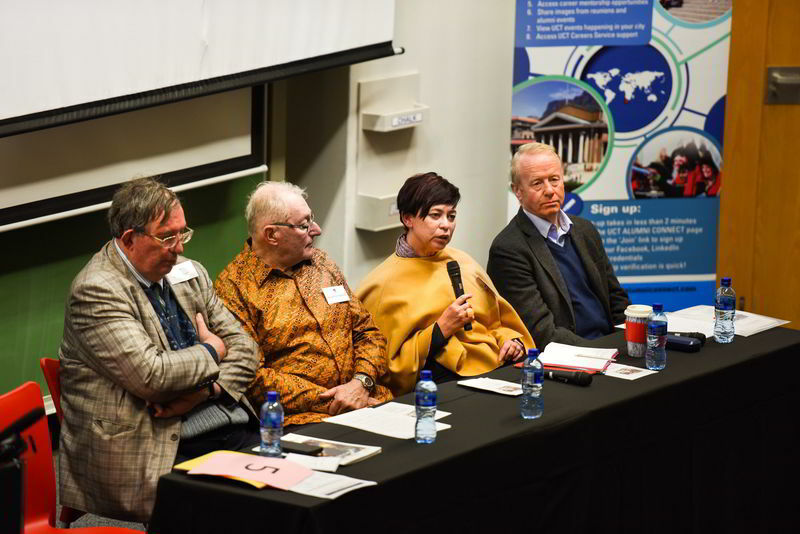 This week members of UCT Spirit of ’68 returned to campus for their Golden Reunion, a series of events coordinated by the Development and Alumni Department, culminating in a panel discussion, “Then and Now: Academic Freedom, Democratic Freedoms, and Current Challenges to UCT”. It was moderated by former President of Convocation Professor Barney Pityana. Students march from Jameson (now Memorial) Hall to protest the overturning of black academic Archie Mafeje’s appointment as senior lecturer, social anthropology, at UCT. Photo UCT archives. This was probably their last reunion, said veteran Keith Gottschalk, former Fulbright Scholar, retired political scientist and anti-apartheid poet. Speaking at the panel discussion, veteran Madi Gray read from Emeritus Professor Francis Wilson’s 1968 editorial in Outlook magazine: “There can be few events which for a limited time, at least, have enjoyed support ranging all the way from Radio Albania through the students of Britain and Dar es Salaam to the Wynberg Youth branch of the United Party. According to the editorial, they also faced the “threat of police intervention, heavy criticism from private individuals and a shocking attempt, fortunately forestalled by commendable police action, by Stellenbosch students to use violence in breaking up the sit-in …”. 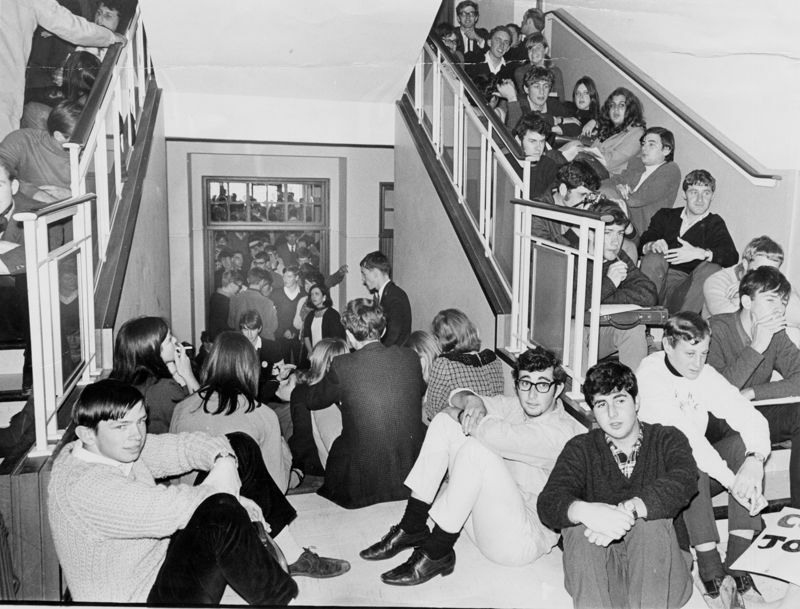 Students during their nine-day sit-in of Bremner building. They continued their studies, cooked communally on Primus stoves and left the building mainly to wash. Photo UCT archives. It wasn’t an isolated event – 1968 was tumultuous worldwide, said veteran and panellist Adrian Guelke, professor of comparative politics at Queen’s University, Belfast. From the Tet Offensive in Vietnam to the Battle of Grosvenor Square in London, the assassinations of Martin Luther King and Robert Kennedy, the Paris student revolt, and the Warsaw Pact invasion of Czechoslovakia, to the Black Power salute at the Mexico Olympics and the first hijacking of an El Al jet by Palestinians, there were powerful portents of global change. “It was a turning point in the world. And why it  attracted so many interpretations,” said Guelke. Though these were diverse events, there were many commonalities, he added. There were student disturbances in many countries, with connections between the protests, especially across Africa, as well as high-profile cases in Mexico and Brazil. That year also saw the emergence of a host of student leaders who were “megaphones” of a larger movement that included workers: Daniel Cohn-Bendit and Alan Geismar, France; Tariq Ali, Great Britain; Karl-Dietrich Wolff, West Germany; Jan Kavan, Czechoslovakia; and Steve Biko in South Africa. Many are still with us, said Guelke. Youth had remained a powerful driver of change. He noted especially the election of a raft of very young leaders today: Emmanuel Macron in France, Jacinda Ardern in New Zealand and Leo Varadkar in Ireland. But, chillingly, while the 60s had given rise to the new left, “what has emerged post-Obama is the new right”. Gottschalk, formerly head of political science at the University of the Western Cape, remembered the oppressiveness of the 60s in South Africa when every book on his reading list prescribed for political science students was banned by the apartheid government. But the students and the country now benefited from a strong Constitution and Bill of Rights, ensuring academic freedom and freedom of speech. What have been the gains? Comparing the sit-in of 1968 and the protests of 2015 to 2017, panellist Deputy Vice-Chancellor Professor Loretta Feris said it was notable that the sit-in was a mass protest that united the student body under one banner. Similarly, during the Rhodes Must Fall campaign students had also organised themselves along non-party lines, united by a common goal. However, this had changed in 2016 and 2017 when the focus turned to Fees Must Fall and social media gave the movement impetus countrywide. Reflecting on 1968 and the more recent events, she said it was important to ask what had been the gains. 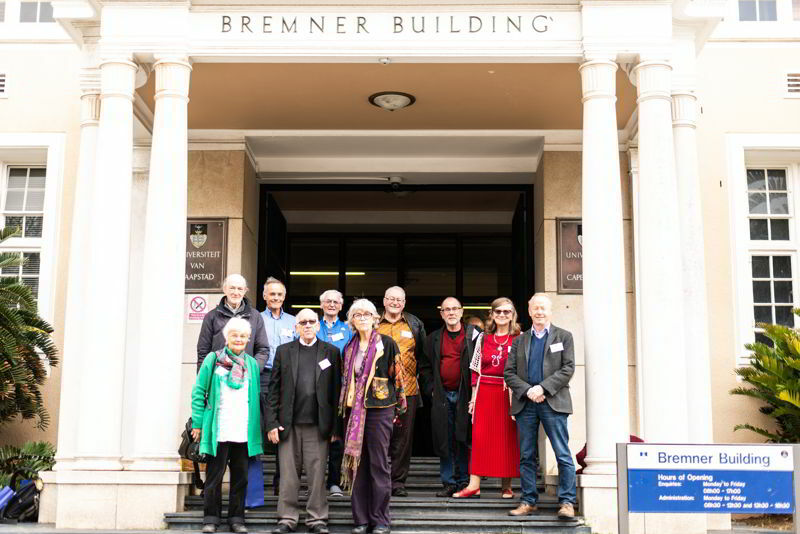 Veterans of the 1968 occupation visited Bremner building during their week-long Golden Jubilee reunion. Photo supplied. Panellist Martin Plaut, senior research fellow at the Institute of Commonwealth Studies at the University of London, was only 18 at the time of the sit-in. The issues of the time – gay, feminist and black rights – became the guiding light for his generation and over the years had been “slowly, painfully moved forward”. However, the rise of the far-right was a concern, embodied by US president Donald Trump, Russian president Vladimir Putin, attitudes towards immigrants in the wake of far-reaching instability in the Middle East – and growing neo-fascism, as seen in Germany. AUGUST 2018 | STORY HELEN SWINGLER.